The EU-ASEAN Business Council is a pan-ASEAN platform for European businesses to advocate their trade and investment interests in South East Asia. Composed of senior business representatives, it allows its members to engage in high-level meetings with policy-makers in the ASEAN countries. The EU-ASEAN Business Council (EU-ABC) is the primary voice for European Business within the ASEAN region, being endorsed as it is by the European Commission and recognised as such by ASEAN. Independent of both bodies, The Council was established to help promote the interests of European businesses operating within ASEAN, and to advocate for changes in policies and regulations to further promote trade and investment between Europe and the ASEAN region. The Council works on a sectorial and cross-industry basis to help improve investment and trading conditions for European Businesses in the ASEAN region through influencing policy and decision makers throughout the region and in the EU. The Council also serves as a platform for the exchange of information and ideas amongst its members and regional players within the ASEAN region. The EU-ABC’s membership consists of large European Multi-national Corporations and the eight European Chambers of Commerce from around South East Asia. As such, the EU-ABC represents a diverse range of European industries, cutting across almost every commercial sphere from car manufacturing and financial services, to Fast Moving Consumer Goods and high-end electronics and communications. Our members all have a vested interest in enhancing trade, commerce and investment between Europe and ASEAN. For more information about the EU-ABC and membership details, please visit the website here. Following the success of the previous 2, the 3rd ASEAN-EU Business Summit concluded two days of discussion between European and ASEAN business leaders with ministers and government officials from ASEAN and the EU Commissioner of Trade to encourage continued economic and trade integration between the two regions. 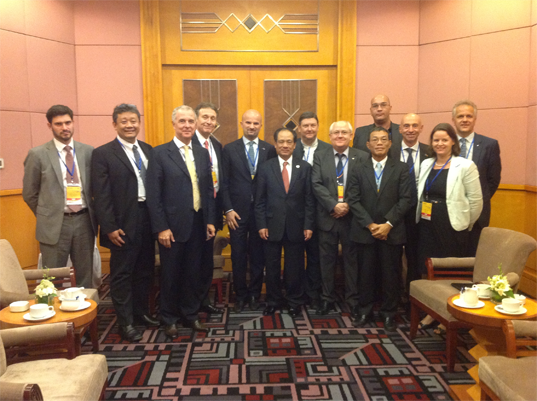 During side meeting at the 3rd ASEAN-EU Business Summit on 8th and 9th March 2013 in Hanoi, Vietnam, the EU-ASEAN Business Council met with European Commissioner H.E. Mr. Karel De Gucht, Vietnam’s Minister of Trade Mr. Vu Huy Hoang, and ASEAN Secretary General Mr. Le Luong Minh to discuss current trends and the outlook for trade integration and business collaboration between ASEAN and the EU.